There are 25 Memory Care Facilities in the Lenexa area, with 1 in Lenexa and 24 nearby. The average cost of memory care in Lenexa is $2,577 per month. This is lower than the national median of $4,650. To help you with your search, browse the 62 reviews below for memory care facilities in Lenexa. Better rated regions include Overland Park with an average rating of 4.3 out of 5 stars. Caring.com has helped thousands of families find high-quality senior care. To speak with one of our Family Advisors about memory care options and costs in Lenexa, call (855) 863-8283. With 53,553 residents, including 7,068 senior citizens, Lenexa, Kansas, is one of the largest suburbs in the Kansas City metropolitan area. According to federal data, 10.8 percent of Medicare beneficiaries in Johnson County, or about 763 adults in Lenexa, have Alzheimer's disease or dementia. To serve residents with dementia, there are approximately two dozen memory care facilities are located in Lenexa and the surrounding area. 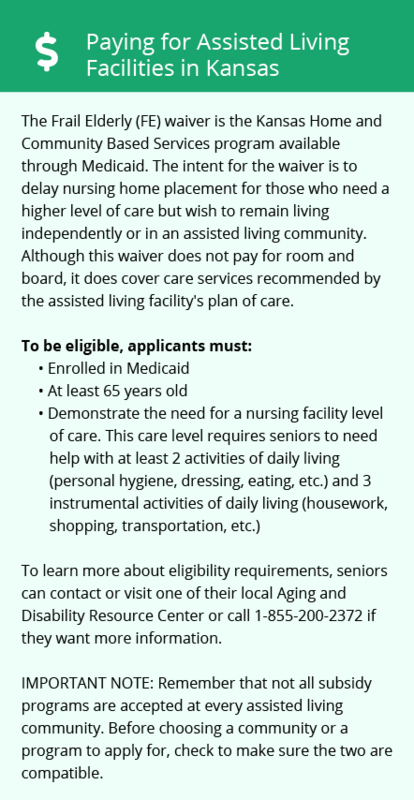 Kansas does not certify dementia care units, but they must meet the same standards as home plus, assisted living and residential health care facilities. Additionally, they must have appropriate training programs for dementia care staff members. With winter lows around 21 degrees and summer highs around 88 degrees, Lenexa has a true four-season climate. It receives less snow than the average U.S. city and slightly less rain. Residents also enjoy an extra 15 days of sunshine. Due to the variable weather, memory care facilities should have adequate climate controls and safeguards to prevent seniors from wandering outdoors. Lenexa has a moderate cost of living that's about 26 percent higher than other parts of the state. Housing expenses are almost 50 percent higher than the rest of the U.S. while other costs, such as utilities and health care, are close to average. Despite the higher costs, Lenexa's quality of life makes it an attractive destination for retirees. The area's above-average cost of living is compounded by the state's income tax system. While most Social Security, government pension and Railroad Retirement benefits are exempt, IRAs and 401(k)s are subject to state income tax. Kansas also has a fairly high sales tax rate, which can cut into retiree's disposable income. Overall, the crime rate in Lenexa is lower than most cities. Compared to the U.S. average of 31.1, Lenexa has a violent crime rate of 26.8. Likewise, the local property crime rate is 30.3 versus 38.1 nationally. Still, memory care facilities should have restricted access systems in place to protect residents and to prevent occupants from leaving. Memory Care costs in Lenexa start around $2,577 per month on average, while the nationwide average cost of memory care is $4,799 per month. It’s important to note that memory care rates in Lenexa and the surrounding suburbs can vary widely based on factors such as location, the level of care needed, apartment size and the types of amenities offered at each community. Lenexa and the surrounding area are home to numerous government agencies and non-profit organizations offering help for seniors searching for or currently residing in an assisted living community. These organizations can also provide assistance in a number of other eldercare services such as geriatric care management, elder law advice, estate planning, finding home care and health and wellness programs. To see a list of free memory care resources in Lenexa, please visit our Assisted Living in Kansas page. 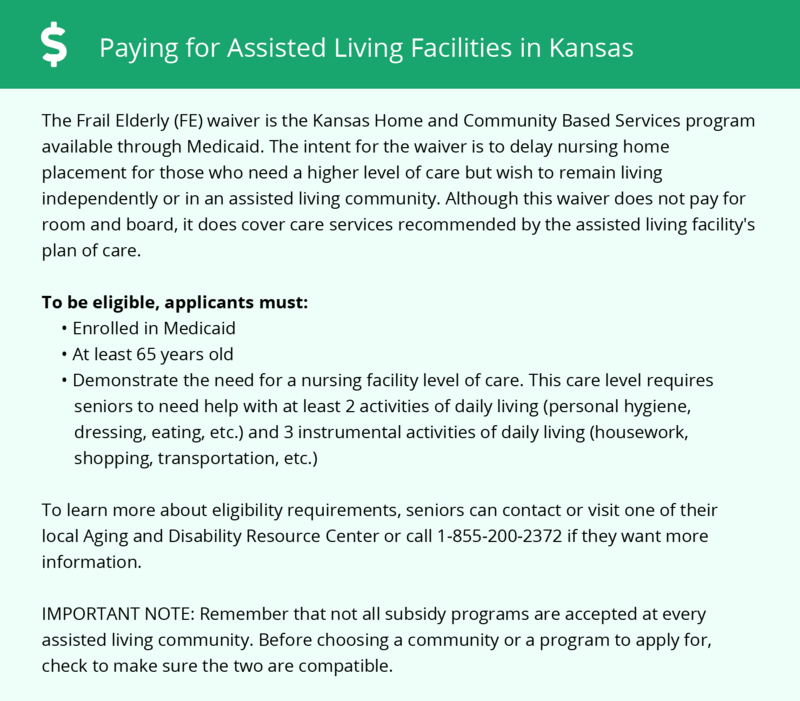 Lenexa-area assisted living communities must adhere to the comprehensive set of state laws and regulations that all assisted living communities in Kansas are required to follow. Visit our Memory Care in Kansas page for more information about these laws.